Nature's Intent Calpril® is made of calcium carbonate (limestone) which is crushed to a very fine powder: 100% will pass a 30 mesh screen; 70% will pass a 100 mesh screen; and more than 35% will pass a 325 mesh screen. The powder is then constituted into spherical granules held together with a binding agent. These granules are then sized to a maximum of 4 mesh and a minimum of 14 mesh. The binding agent used to make Nature's Intent Calpril® is highly water-soluble. Consequently, as soon as Nature's Intent Calpril® granules come into contact with water, disintegration of the granule begins, and the many small particles which comprise the granule are released into the surrounding soil water medium and the reaction to correct soil pH begins. For best results, store in a dry location. 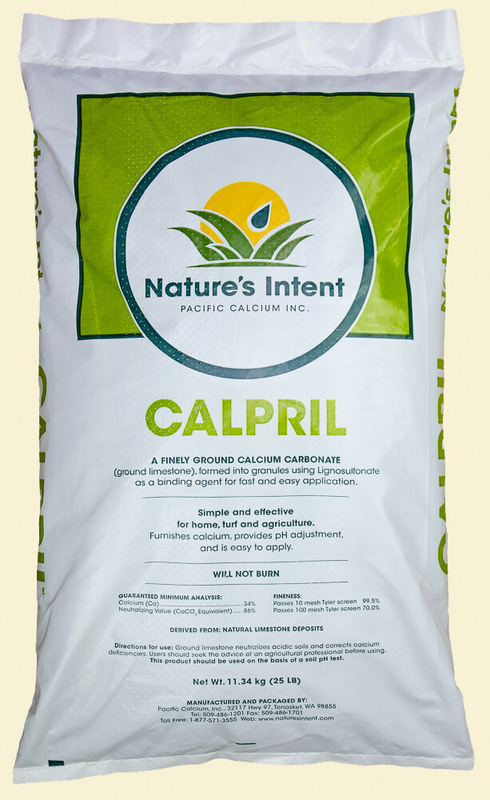 Nature's Intent Calpril® is 100% natural and is listed by the Organic Materials Review Institute (OMRI), Washington State Department of Agriculture (WSDA) Organic and the Oregon Department of Agriculture (ODA), for use in organic crop production.